Dizao BOTO face masks are deleloped exclusively for aging skin with the aim to restore its elasticity, moisturize, nourish and protect it, eliminate wrinkles and fine lines from its surface. The unique and highly-advanced formula of Dizao BOTO masks relaxes face muscles in the way, similar to one, provided by botox injections. As a result, both fine lines and deep wrinkles get smoothed. BOTOserums and BOTOgels of the masks` second stage boost penetrating power of active ingredients so that they can reach the deepest layers of the skin. 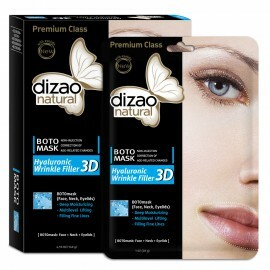 Give a try to Dizao BOTO face masks, the safest alternative to botox injections!